Social is key when it comes to retargeting on mobile devices. In fact, a new study from programmatic advertising platform Chango found that 41 percent of brands and agencies believe that social exchanges are very important to retargeting on both smartphones and tablets, as these exchanges reach consumers regardless of the device they are using. Additional findings reveal that mobile retargeting is growing as a marketing tactic, with 26 percent of brands investing 21-50 percent of their online budgets into mobile marketing in 2014. Comparatively, only nine percent placed 21-50 percent of their budget into mobile in 2013. The study also shed light on paid social, with the data finding that about 38 percent of buyers are leveraging Twitter’s tailored audiences and 67 percent are using Facebook’s FBX. Plus, 33 percent of brands and 36 percent of agencies give paid social its own budget. It is also important to note that the study found 11 percent of brands and seven percent of agencies use retargeting to acquire their competitors’ customers. 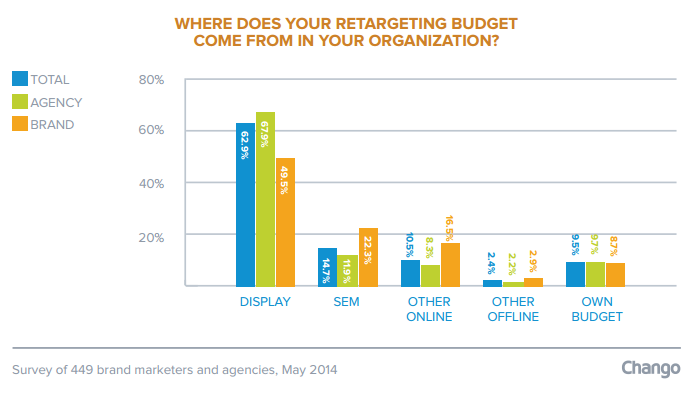 Moreover, just less than 10 percent of brands and agencies give retargeting its own budget, while nearly 63 percent of retargeting budgets are taken out of display budgets.